Mike Rosenbluth is a prostate cancer survivor and volunteer with Fans for the Cure. Mike Rosenbluth is a prostate cancer survivor and volunteer with Fans for the Cure. 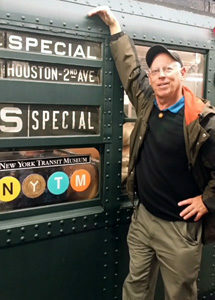 He shares a passion for New York City Transit and sports history with Fans Founder Ed Randall, his former teammate on the “Six Toes” in the Eastside Adult Softball League. In a season of giving thanks, these few words – in the direction of Ed Randall and Fans for the Cure – are genuinely in order. It was, as they say, a “great catch”, when my primary care physician spotted an uptick in my baseline PSA value a few years back. Even though the PSA was slightly elevated, I was non-symptomatic and all systems seemed “go”; he repeated the test and recommended a visit to a urology specialist. I went. A prostate biopsy revealed the surprising, and frightening, findings. Immediate thoughts? To learn about all available options, to believe I could be healed and to touch bases with my “brain trust” – my spouse, my physicians, and a call to Ed Randall. Ed’s been there, and with Fans for the Cure, he has taken prostate health awareness to the next level. He encouraged me to follow through with a treatment plan. With expert care and rehab and the backing of family and friends (and teammates), I was back to work and back to the softball fields I loved playing on. Working with Ed and other Fans for the Cure volunteers at venues like Yankee Stadium and, most recently, at Barclay’s Center with the New York Islanders, handing off a pamphlet or bracelet, hearing the voices of concerned men (and their partners!) and knowing that any guy could be the next guy who gets a “great save” – that’s all good. Whether you’re a survivor, going through treatment now, or you’ve been impacted by prostate cancer, we want to hear your story. Your voice matters.